Should you google your health issues? 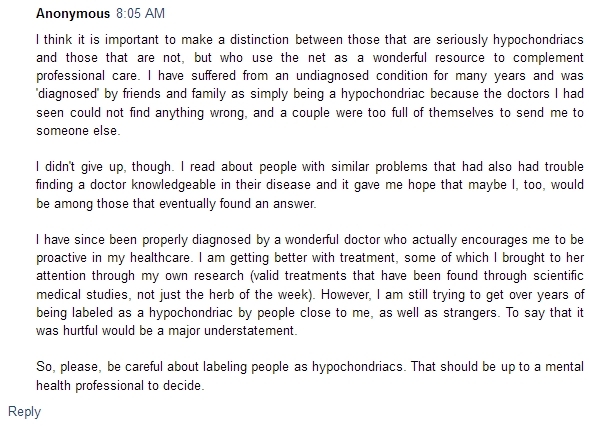 Long back, I had written a post about how hypochondriacs have become obsessed about using the net to diagnose their symptoms and got chided by a commenter for branding all those who search for online health information as "cyberchondriacs" or "hypochodriacs". Does googling for symptoms help? 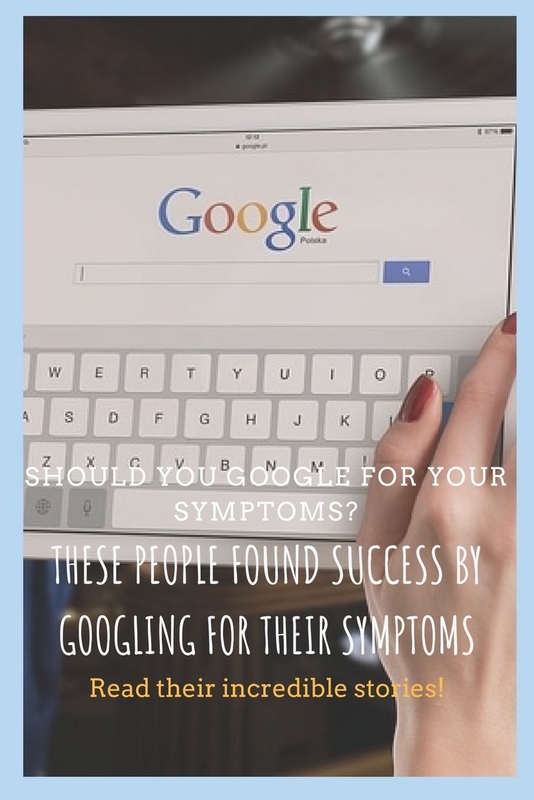 So is googling for your health issues and symptoms really a bad idea? Doctors are of the opinion that scouring the web for yours or your loved one's symptoms and self-diagnosing can lead to unnecessary anxiety. A google search for some vague symptoms throws myriad results. The information shown on some of the sites that come up in the search results may or may not be accurate. You may end up believing you have cancer, heart problem, dementia or any other life-threatening condition even when your actual issue is very simple and easily treatable. Your doctor, on the other hand, just by looking at you and making some preliminary examination can pinpoint your problem and make a correct diagnosis. But that does not mean that you should never look for health information online! No. However, you should do it intelligently and mostly depend on properly accredited, genuine health sites like NHS Choices, patient.info, Mayo Clinic and the US National Library of Medicine. And never ever self-medicate or buy medicines online on your own without consulting your doctor. By the way, there are some people who have found success for their health issues by scanning the internet diligently and bumping into the right kind of sites and health forums. Do go through their stories carefully. Doctors made a range of vague diagnoses for Kavitha's daughter, who was suffering from extreme spells of dizziness and a slight nausea. Faced with no diagnosis, Kavitha turned to the internet to find the answer and figured that her daughter had migraine associated vertigo (MAV). Finding a doctor who believed her was another challenge. She finally found one such doctor in Mumbai, who confirmed the diagnosis. For a time I, too, faced with no diagnosis, believed it was psychological. But, as the months went by, I started thinking the real disease lay hidden . I started searching the internet as soon as we returned from the holiday. The difficulty was that dizziness could be a symptom of a great many diseases, from hearing disorders to anaemia. I had to thread my way through a thicket of information. Then, one day, through sheer luck, on Page 6 of a Google search, I came across a Daily Mail article, of all improbable things, in which a young girl seemed to have exactly the same symptoms as my daughter. She too, had been told it was all in her mind. The disease was called migraine associated vertigo (MAV), a lesser-known variation of the regular migraine. MAV, as it is called, is often overlooked or confused with other diseases, because unlike regular migraine, sufferers don’t get headaches, see flashing lights or have blackouts. Once you have some information, go back to your doctor, preferably a specialist. But don’t figure out a cure yourself. My daughter was cured only by a careful cocktail of drugs, which I certainly could not have found on the internet. This is one more case of the medical profession failing to find a cure. In this case (potentially very serious) I went against the advice of a cardiologist who gave me a beta blocker for my "disease". I hated the medicine, and hated the idea that I was to take this medicine for the whole of my life. I also disliked the idea of doing an ablation (operation) which could make things worse. Instead, I chose to stop the medicine and kept searching and reading the literature till I found something worthwhile to try. Highly "qualified" ophthalmologists have simply no idea about the effects of excessive computer use on eyeball muscles. They mix up symptoms from eyestrain with symptoms of dry eyes or inflammation. The entire medical profession badly let me down on this issue. After nine miscarriages, Teresa Edgeler had almost given up hope of becoming a mother. But she trawled the net and found a vital clue about why some women repeatedly miscarry. I read on Google of a woman who had 18 miscarriages before giving birth to a healthy baby. She’d been diagnosed with excessive levels of natural killer (NK) blood cells, which attacked her unborn babies in the womb, causing her body to reject the pregnancies. What really caught my eye was that — like me — she’d lost her babies after six to eight weeks of pregnancy. However Theresa's success story must be taken with a pinch of salt. According to IVF specialist Dr. Malpani, testing for NK cells is just hogwash and a waste of time and money. Read the articles: Why Natural Killer (NK) cell testing for IVF failures is a lot of hocus-pocus & NK cell testing – yet another way to exploit the vulnerable infertile patient! & The smoke and mirrors behind HLA matching and NK cells activity assay – the “reason” and “cure” for unexplained implantation failure! So make an informed decision before going for such tests and treatments for your recurrent abortions or implantation failures. In conclusion, looking for answers for your health issues at times is not not something to be detested, but you should be concerned if it becomes an obsession with you. If you feel overtly fearful of health and increasingly search the net for your symptoms, go for a gamut of tests and always fear that something is wrong with you, you might be suffering from hypochondria as well as cyberchodria. In any case, a mental health professional has to decide that. So if you are exhibiting these symptoms, it's time to see a medical counsellor and not get lost in the maze of internet health sites. 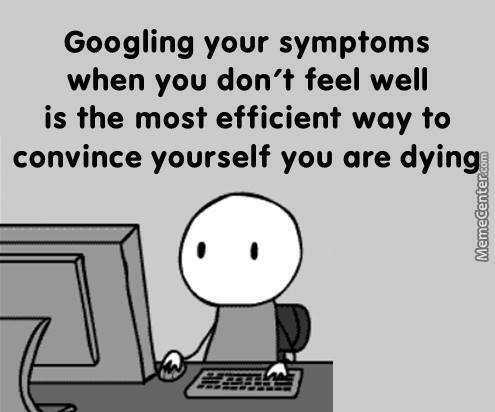 Googling symptoms can turn patients into a new type of hypochondriac. Hypochondriacs aren’t faking their anxiety and they aren’t seeking attention. They are genuinely fearful or distressed about their medical condition—even if their fears are irrational. This often leads to frequent and sometimes unnecessary trips to the ER, urgent care or physician’s office, and ends up costing patients and the healthcare industry billions of dollars each year in unnecessary medical tests and treatments.